Downloads two drones; discard event. OR Plays on table. Each turn, report on of your cards for free or make an additional end-of-turn draw (immune to Kevin Uxbridge). 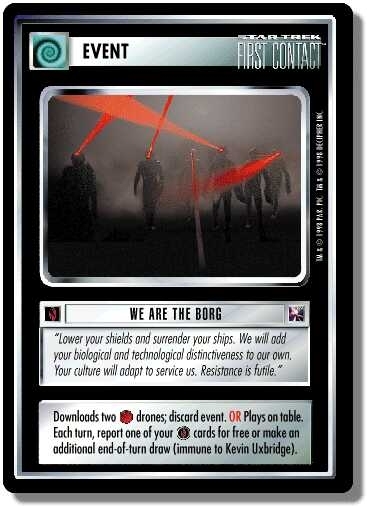 There are 27 entries for We Are The Borg (ST1E 0 P 62) at the Tradeplace (11 haves and 20 wants). Click here to see all trade list entries for this Promotion card! Also see here for all trade lists with any card fom "Enhanced First Contact".